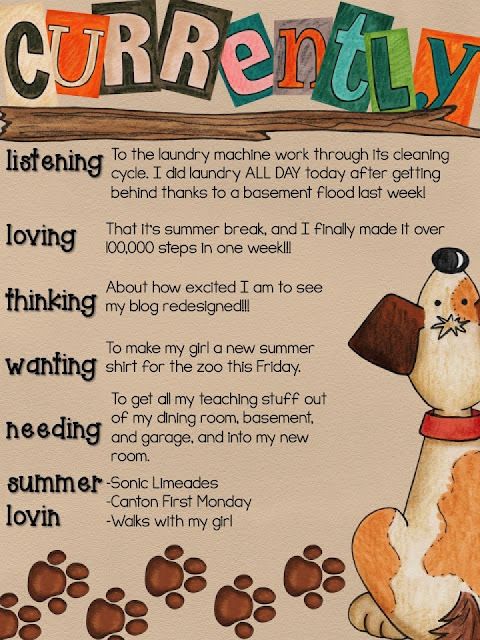 It's time again for Currently with Farley over at Oh' Boy Fourth Grade! You can join up by clicking on her button below. 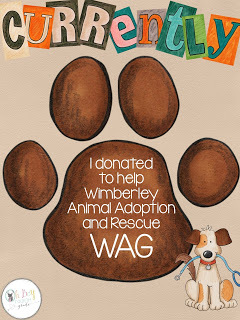 Before I get into my Currently, I want to challenge you to donate to Wimberly Adoption Group and Rescue (WAG), something that is near and dear to our host's heart. You've probably heard of the devastation in Wimberly from the massive flooding in Texas. What I wasn't really aware of was how much this affected pets and other animals. Thank you, Farley, for bring this to everyone's attention! If you are feeling lead to contribute to WAG, head over to Farley's page this week and find the donate button. Listening: Texas wasn't the only place getting a ton of rain. I have never seen so much rain in Colorado. We had rain for I think 24 days in a row. Our basement flooded 3 times. Window wells are a NIGHTMARE. It floods during heavy rains, and then it continues to flood after it stops raining as all the water in the ground seeps up into it. Insurance won't cover anything unless there's a flash flood warning issued for our area. So...we used up every single towel-including beach and decorative towels-to sop up water in the basement. It was a constant wash and dry, wash and dry, as we tried to dry everything out for the past week. We finally put a sump pump in the one problematic window well, so hopefully this won't happen again!!! And the laundry is done!!! Hallelujah!!! Loving: I love summer break! I taught summer school last year and felt I was robbed of summer, so I am really taking the time to do what I want this summer. One of those things is to work out more. I'm following a couch to half-marathon plan, so I'm really getting those steps in on the Fitbit. Thinking: I'm having my blog redesigned by Designs by Tenille and I am sooooo excited to see it. I like my design now, but after I saw some of the new blogs out that she designed, I just new I had to have her do mine, too! Can't wait to do a reveal! Wanting: I have a great Babylock sewing and embroidery machine that my hubby gave me last year, and I love making shirts for my 2 year old. We're heading to a special night at the zoo this Friday, so I think a new shirt might be in order! Summer Lovin': I'm trying to wean myself off the Dr. Peppers that keep me standing upright during the school year, but I still like to treat myself to a Diet Limeade on nice summer days. Plus, I bring home a bag of Sonic ice. I love chompin' on that ice! Also, I can't wait to get to Texas to visit my family and go to Canton First Monday. Oh, the crafts!!! The bows!!! The t-shirts!!! I can hardly wait. And finally...I've got a new found love of taking walks with my girl as the sun goes down. It's past her typical bedtime, but there's something so sweet about her noticing the moon and starting to count stars. I'm looking forward to many more walks this summer! Well, that's a wrap for this month's Currently. See you next time...hopefully with a new blog design!!! 100,000 steps. . .that's impressive!! I'm so sad. . .my FitBit fell off a couple of weeks ago & I have no idea where it is!! I think I have to get a new one because it definitely kept me accountable!! Good luck training for the 1/2 marathon & enjoy that sweet girl of yours; they grow up too fast!! thanks so much for the donation and for the great shout out about WAG!!! and way jealous over here… I have longed to go to Canton… I will one day!! !